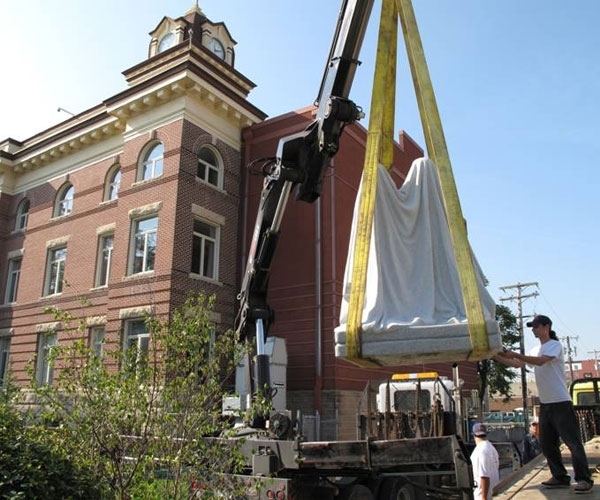 The project was commissioned through the Winnipeg Arts Council’s Public Art Program in collaboration with La Maison des artistes visuels for the newly developed Jardin de sculptures. The garden is located on public land in the French quarter of the city. About twenty permanent works of varying dimensions will eventually make up the garden, as well as a number of temporary works and an in situ space for creation. A national Call-to-Artists was issued seeking a French-speaking artist to create a permanent, contemporary artwork. 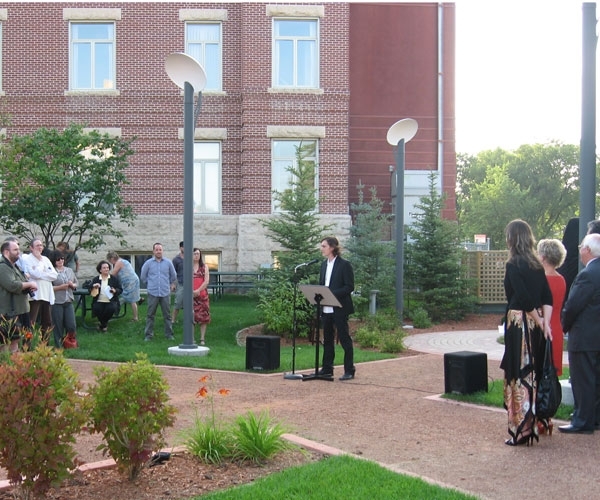 Michel de Broin was selected from a shortlist of five that included artists from Manitoba and Quebec. Michel de Broin, an artist of international acclaim, employs a variety of media to realize his ideas. With Monument, de Broin uses a traditional form and material, applying as he says “a decidedly contemporary spin to a classic motif.” The work was inspired by the enigmatic paintings of Rene Magritte and references classic monumental sculpture while breaking away from recognizable figures. In Monument, the figures are concealed and anonymous -- they remain a mystery on which each viewer can project their own meaning. 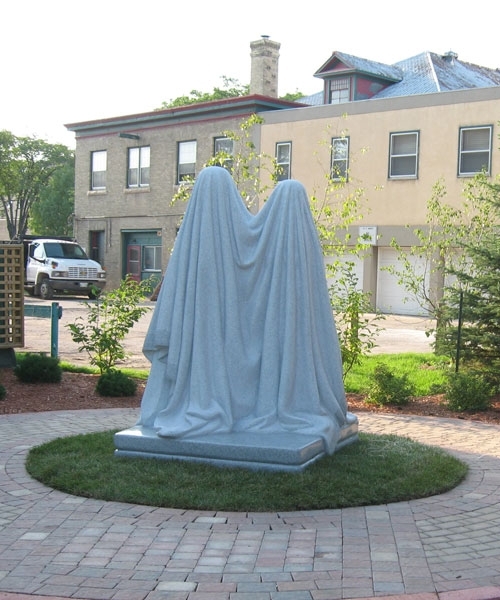 de Broin was influenced by a number of physical elements in Winnipeg’s landscape as well: the draping of snow in winter, the burlap-swaddled cedar trees, the statuary of the St. Boniface Cathedral Cemetery. “Monument is a mystery that will never be entirely revealed. One can recognize its classical motif borrowed from the tradition of monuments, but disrupted from the passivity of the academy. 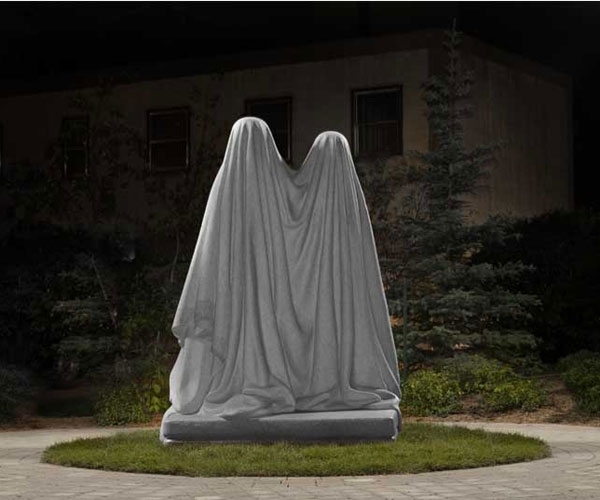 It announces itself as an invitation to an experience where the meaning is projected by the passerby onto the white screen of the veil covering the characters' enigma. The veil draws aside the individual identity and reveals the anonymity of being. Something is pulling us to the other beyond its representation.” Michel de Broin. Based in Montreal de Broin has received international acclaim for his sculptural projects and installations, and won the Sobey Award in 2007. Co-inciding with the unveiling of Monument was de Broin’s first solo exhibition in Western Canada at Plug In ICA, entitled Distruption from Within. Other recent solo shows include Reciprocal Energy at the Mac/Val (Vitry-sur seine, Paris, 2008), The National Gallery of Canada ( Ottawa, 2006 and 2007), Musée national des beaux arts du Québec (Québec City, 2006), PSWAR (Amsterdam, 2007), Kuenstlerhaus Bethanien (Berlin, 2006), Galerie Isabella Bortolozzi (Berlin, 2005), La Bf15 (Lyon, 2005), Galerie Pierre-François Ouellette (Montreal, 2005), La Vitrine (Paris, 2004) and Villa Merkel, (Esslingen, Germany, 2002). 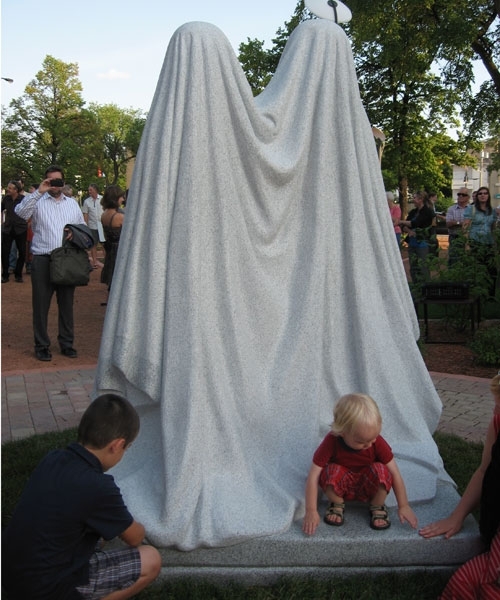 Public artworks created by de Broin include a memorial to Salvador Allende recently installed in Montreal, Encircling (2006) in Christchurch, New Zealand, and Revolutions (2003) in Montreal. de Broin has also been part of many group exhibitions in Canada, Europe and United States, among them Villa Arson (Nice 2008), Berlinische Galerie (Berlin, 2007), Plug In (Winnipeg, 2006), Haus Am Waldsee (Berlin, 2006), Kunstverein Wolfsburg (Wolfsburg, 2006), Christian Nagel (Berlin, 2005), Exit Art (New York, 2005), Fototeka (Havana, Cuba, 2004), The 11th Biennial of Visual Arts (Pancevo, Serbia, 2004), Museum of Contemporary Canadian Art (Toronto, 2003), Optica (Montreal, 2003), Gallery 44 (Toronto, 2003), Kunsthaus Baselland (Muttenz, Switzerland, 2000), Center for Curatorial Studies (Annandale-on-Hudson, New York, 1998). His work has been reviewed in Parachute (Montreal), Artpress (Paris), Technickart (Paris), Semaine (Arles, France), Espace (Montreal), Esse (Montreal), C-Magazine (Toronto), Border Crossings (Winnipeg).